It’s official. Harry Potter is the boy who lived – more than 20 years after Harry Potter and the Philosopher’s stone first hit the shelves and we STILL can’t get enough of him. London just so happens to be a rather magical place for Harry Potter fans. In fact, I’ll go as far as saying that there are few destinations that boast so many cool Potter related locations (believe me, I’ve looked). 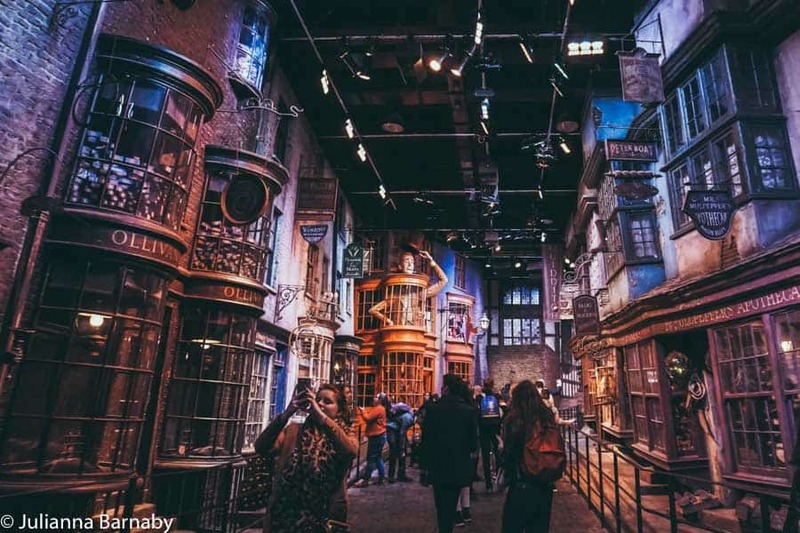 You can whizz around the film studios, challenge yourself to a Potter-themed escape room, or take a self-guided tour of many of the locations that pop up in the films. As someone who snuggles down to watch the films every year and has reread the books a rather obsessive number of times, I can’t tell you how exciting it was to discover the world of Harry Potter in London. Now it’s your turn. Let’s go! King’s Cross train station is the very place that the Hogwarts Express departs from in the books and the films. 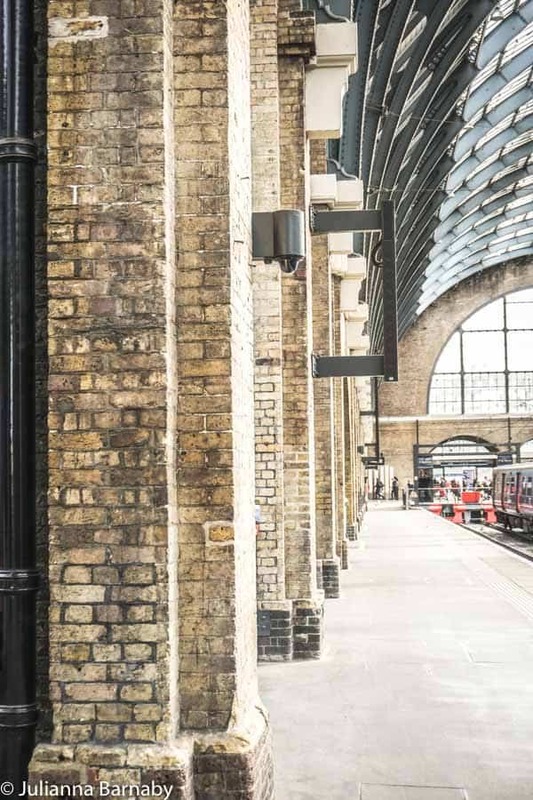 Apart from dreams of what it would be like to actually whizz away on the train to Hogwarts, there are three things that you won’t want to miss within the station. The first is the actual spot between Platforms 9 and 10 where Platform 9 ¾ is supposed to reside. There’s not actually that much to see here though. Much more exciting is the trolley half-buried into the wall poised for you to take that classic shot, and the Harry Potter Shop (which I talk about in more detail in the attractions section below). Both of these are at the edge of the station. Back to that photo of you running through the wall at Platform 9 ¾. I won’t lie – unless you get there first thing in the morning, chances are that you are going to have to queue for it. Like, for hours. I’m not saying that it isn’t worth it but forewarned is forearmed. 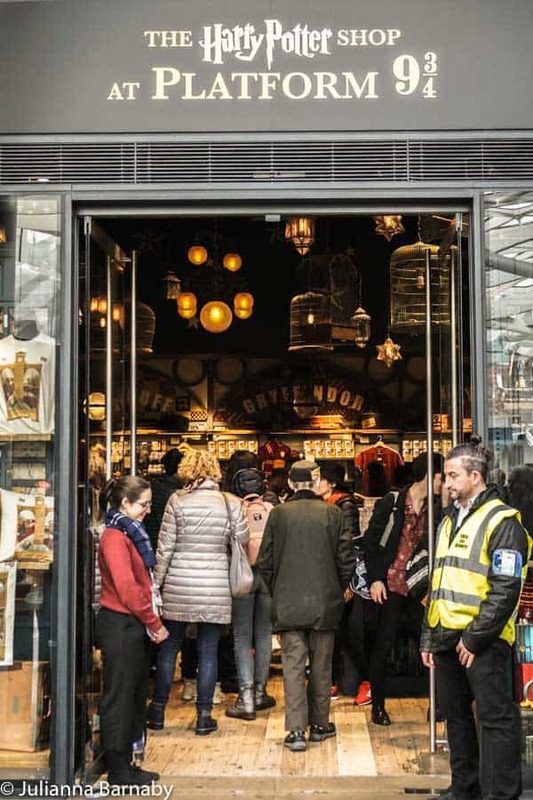 What I will say that if you are going to the Harry Potter Studios – DON’T BOTHER QUEUING at King’s Cross. There are several spots in the studio’s reconstruction of Kings Cross where you can get the same shot and (oh blessed day), there are zero queues. You’re welcome. Just across the road from King’s Cross, St Pancras International Station steals the limelight from its humbler neighbour. The exterior of St Pancras features as the London Harry Potter station the Hogwarts Express departs from. 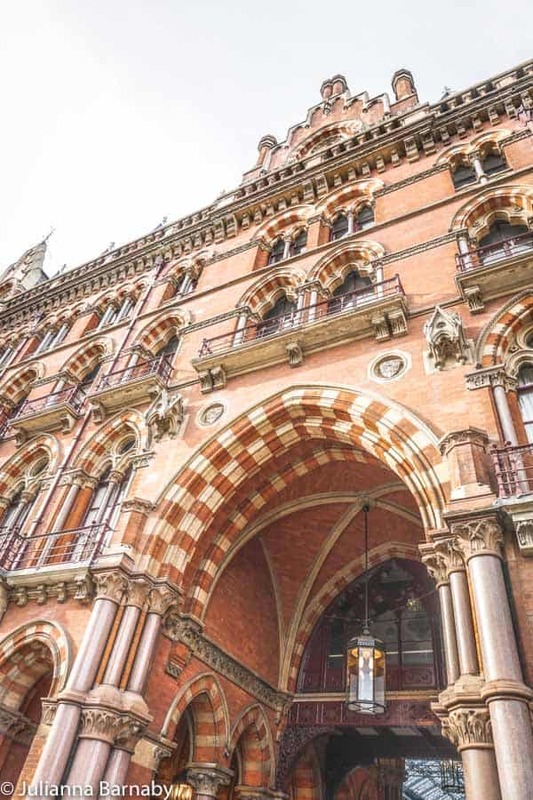 I totally understand why the filmmakers used the exterior of St Pancras in the films rather than King’s Cross… who doesn’t want an eyeful of that beautiful Gothic architecture? Plus it makes it even more dramatic when Harry and Ron purloin the Ford Anglia to fly to Hogwarts when they miss the Express in The Chamber of Secrets right? Does Leadenhall Market look familiar? It was used as one of the Harry Potter filming locations in London for several of the films – specifically as Diagon Alley. Look even closer and you can find the blue door of what was then an empty opticians within Leadenhall Market, which pops up as the entrance to the wizarding pub Leaky Cauldron. Cast your minds back to Harry Potter and the Prisoner of Azkaban, when Harry storms out from the Dursleys only to be rescued by the totally fabulous Knight Bus. Careering through the streets of central London at what is, quite frankly, a rather irresponsible speed, the Knight Bus hurtles around, narrowly avoiding mowing down old ladies and causing destruction. With me now? Then you’ll certainly remember the excitement when the bus has to squeeze between two muggle London buses on a bridge. Lambeth Bridge is that bridge. While you won’t see any optical illusions here, it’s a cool little spot to add to your tour of Harry Potter filming locations in London, if only for the beaut views of the river Thames, Parliament and beyond. 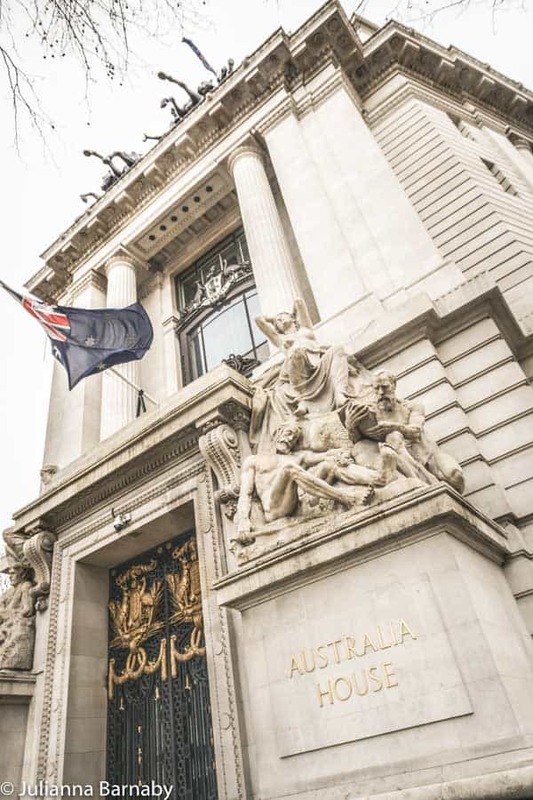 Time to withdraw your galleons – for which you’ll need to head to Australia House, which doubles up as Gringotts in the film series. Unfortunately, the outside was the work of some nifty CGI, but if you can sweet talk your way inside, you’ll see the stately interior that serves as the backdrop to the trio’s antics in Harry Potter and the Deathly Hallows Part II. Have you ever had the sneaking suspicion that maybe, just maybe, you could speak Parseltongue? Well, there’s no better place to test out that theory than in the Reptile House at ZSL London Zoo… otherwise known as the Harry Potter filming location where Harry first speaks parseltongue and sets a snake free. As you do. 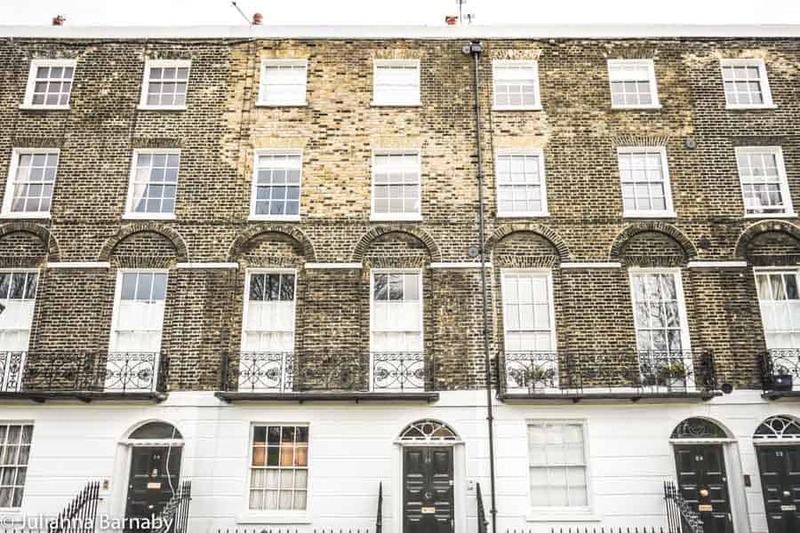 A quiet terrace of Georgian houses in Islington might not look like much but Claremont Square is the film location for 12 Grimmauld Place. Still not ringing any bells? It’s the home of the Order of the Phoenix – a.k.a the Black residence that Sirius kindly donates to be used by the order in Harry Potter and the Order of the Phoenix and by the trio The Deathly Hallows Part I. Make your way to numbers 23 to 29 and all will become clear. Piccadilly Circus is terrifying enough at the best of times. The thronging crowds and neon lights are a recipe of things guaranteed to set your teeth on edge. Well, imagine how stressful it would be if you disapparated there only to be chased by Death Eaters trying to kill you. Sound familiar? That’s exactly what happens to Harry, Hermione and Ron in the Deathly Hallows Part I. Swing by Piccadilly Circus, but keep your eyes open – you never know who’s on your tail. Great Scotland Yard looks innocuous enough. There are some rather beautiful buildings, it’s located just off of Whitehall. Nothing incredible to see here… right? Picture a red telephone box at the junction of Scotland Place and voila – you have the entrance to the Ministry of Magic. Unfortunately, the telephone box was just a prop but know you know, your imagination can do the rest. Now, I know that I said that Leadenhall Market held the entrance to the Leaky Cauldron but there are actually a couple of spots with this title as the films moved about a bit as they progressed. 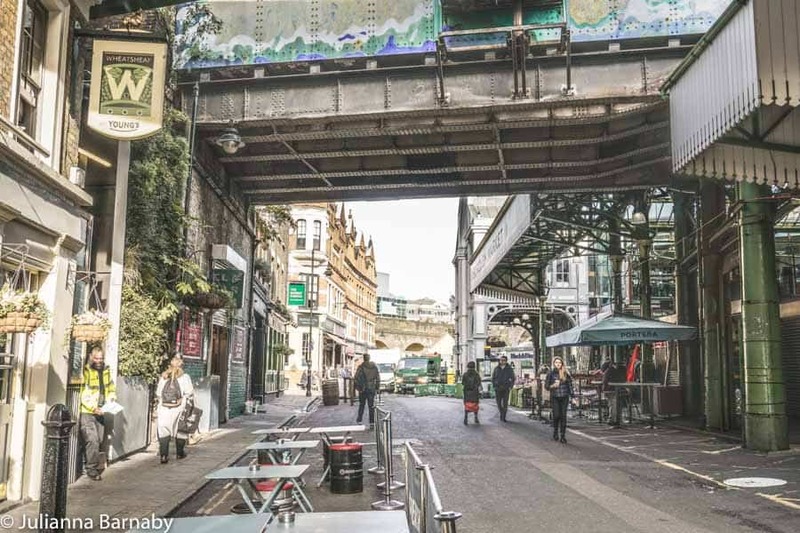 Underneath the railway bridge on Stoney Street, next to Borough Market, features as the entrance to the Leaky Cauldron in Harry Potter and the Prisoner of Azkaban. Westminster might look like any other tube station from the street. However, the beady-eyed amongst you will spot that it was the very same station that Harry used in the Order of the Phoenix when he’s travelling to his disciplinary hearing at the Ministry for his use of magic against the dementors in Little Whinging. I think that we can all agree that those Death Eaters are a right nasty lot. 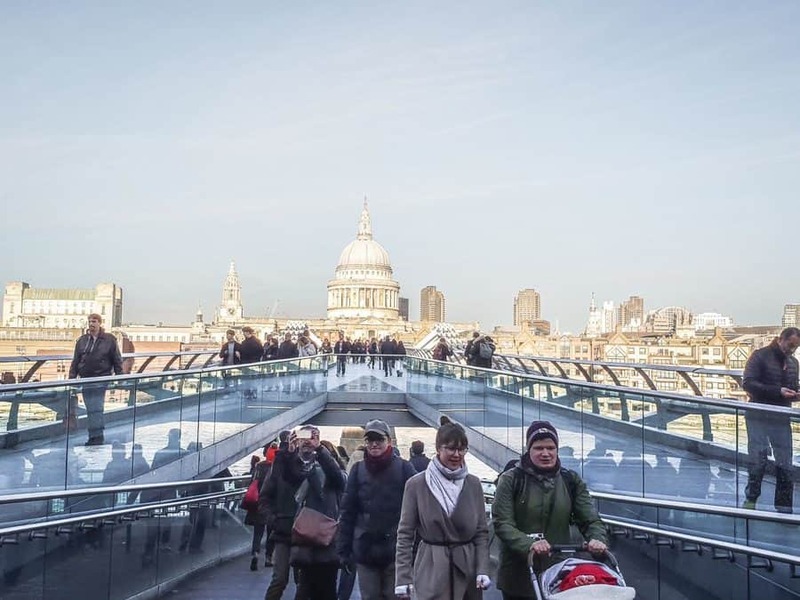 It’s a pretty bad sign of things to come for poor muggle London when they destroy the Millennium Bridge (which has come to be nicknamed the Harry Potter bridge in London), plunging all the people walking along it into the Thames. Perhaps don’t think about that too much while you’re walking over the bridge though. I’ll be honest, Tower Bridge only makes a fleeting appearance in Harry Potter and the Order of the Phoenix. Remember the scene when Harry flies over Tower Bridge on his broomstick? 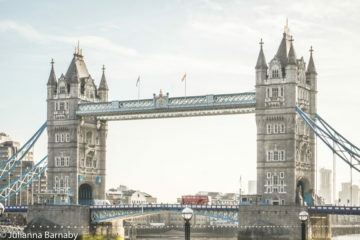 Well, turns out that Tower Bridge is pretty magical even without wizards zipping around it in the air. Who knew? 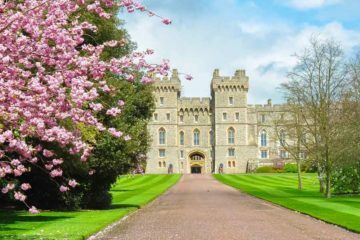 These spots weren’t used as filming locations (apart from the Warner Bros Studios) but they’ve all been inspired by the film and should go straight onto your list of cool Harry Potter locations in London. People. 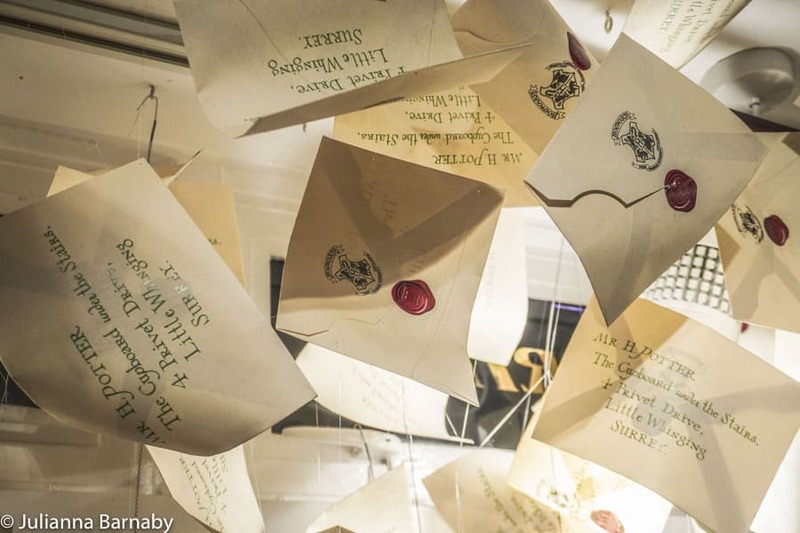 We need to talk about the Harry Potter Studio Tour at the Warner Bros Studios in Leavesden. Short version of that talk = It’s brilliant. Longer version: I finally went last month, trying to pretend that I was totally chilled out about the fact that I was going to spend hours in the film studios where the Harry Potter films were created. Obviously, I was not chilled out, I was more excited than a five year old at Christmas. Even so, it still managed to exceed expectations. Seeing the sets and props IRL, walking along Diagon Alley, seeing the scale construction of Hogwarts – as I said, it’s brilliant. I know that tickets are quite expensive and you have to book ages ahead (though it’s always worth checking as we snaffled ours three days in advance) but it’s absolutely worth it. PS – the studios are in Leavesden, which is a bit of a pain to get to from London. If you don’t have your own transport, it’s easier to book on a tour than trying to get there independently. 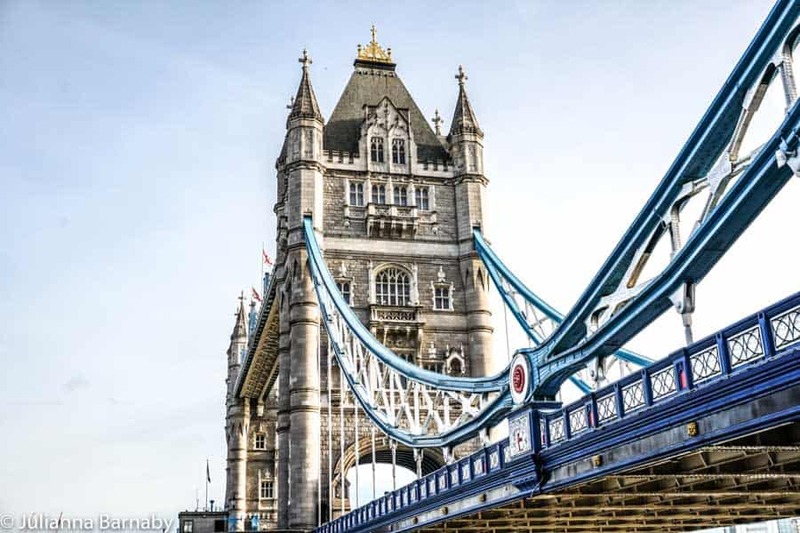 Check tours from London (including transport from central London). The House of Minalima is the shop where all of your Harry Potter-related dreams come true. Part Harry Potter exhibition, part shop, this multi-floored space in Soho was started by two of the graphic designers responsible for bringing the books to life in the films. Eduardo Lima and Miraphora Mina met when working on the Harry Potter films – together, they designed so many of those iconic graphics that you’ll remember – the striking covers of the Daily Prophet, the wanted posters from which death eaters’ faces stare malevolently. As you can imagine, visiting The House of Minalima is a pretty big deal. You can also pick up limited edition posters, cool badges – even your very own potion books to bring home. Now if that doesn’t make you go all heart eyed emoji, I don’t know what will. The Harry Potter Shop at Platform 9 ¾ sits inside King’s Cross Station. 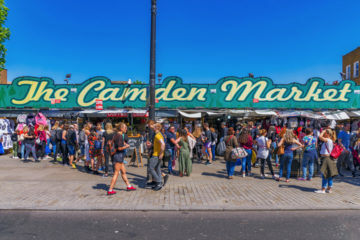 Don’t worry about finding it – just keep your eyes open for the queue of people waiting to get that famous shot with the trolley half buried in the wall. Of course, any shop centred around all things Harry Potter is going to be pretty fantastic – especially when it’s based on a design of Ollivander’s wand shop. Trying on loads of swag from your house (in case you’re wondering, Slytherin / Gryffindor when I’m playing nice) and choosing a wand – what’s not to like? Sorry kids but if you’re under 18, time to skip ahead because The Cauldron is strictly one for the adults. 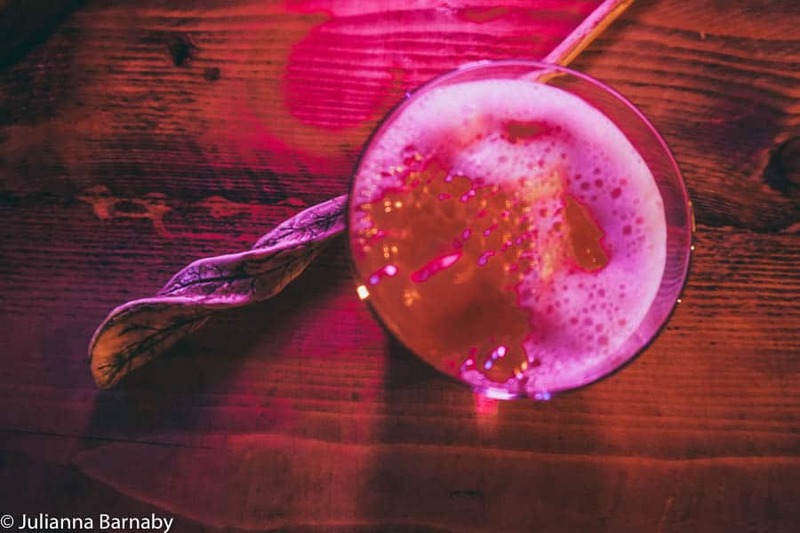 What if I told you that there was a Harry Potter-inspired cocktail bar in London where you can make your own (drinkable and boozy) potions. You would think that was pretty awesome wouldn’t you? Good. Because that’s exactly what I am telling you. 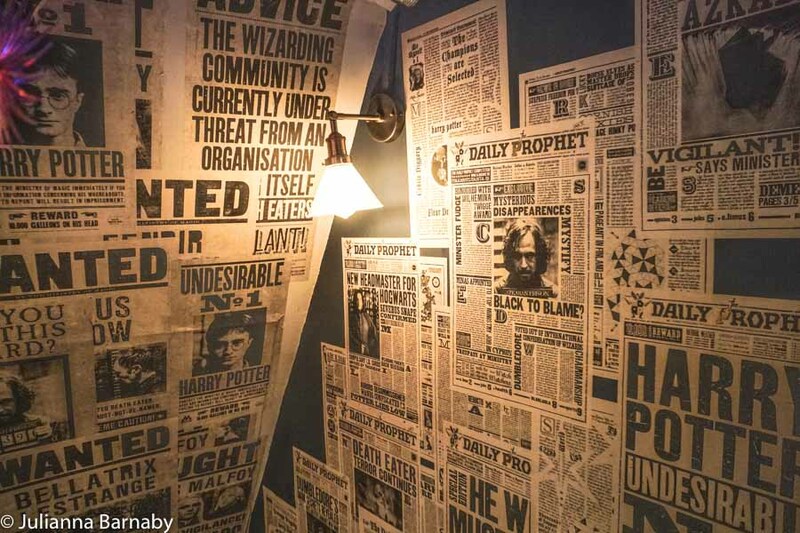 The Cauldron is a cool pop up in Stoke Newington where you can don your robes, pick up your wand and spend a few hours cooking up a few real-life brews. Read More: What’s it Really Like to Visit The Cauldron? I have to be honest here. I haven’t actually been to see Harry Potter and the Cursed Child yet. It makes me endlessly sad inside and believe me, seeing the play (which is actually split into two parts) is high up on the list of awesome things I need to do like, yesterday. Everyone I’ve spoken to says it’s awesome. I’ll be going soon and will update as soon as I have. In the meantime, you can book your Harry Potter and the Cursed Child tickets here. P.S. Tickets for London’s Harry Potter theatre show are hard to come by. They’re about to release tickets for October onwards – but you can snaffle last minute tickets when they’re released each Friday. It should be clear by now that there are a lot of Harry Potter-inspired experiences in London. But few are going to appeal to your stomach as much as the rather delicious Harry Potter afternoon tea at Cutter and Squidge. London does a jolly good afternoon tea at the best of times but when you add in a few drinkable and edible potions, it gets so much better. Escape Rooms can be totally brilliant or pretty naff. We can all guess which category a Harry Potter escape room falls into right? So what does it involve? You and your team of fellow witch and wizard wannabes are locked in a room, your task? To solve a series of Harry Potter-themed enigmas to defeat the dark side and win your freedom. Simples. Fun as it would be to hop on your Nimbus 2000 and speed around the city checking out all of the Harry Potter London locations, chances are you don’t have a magical flying broomstick hanging around. 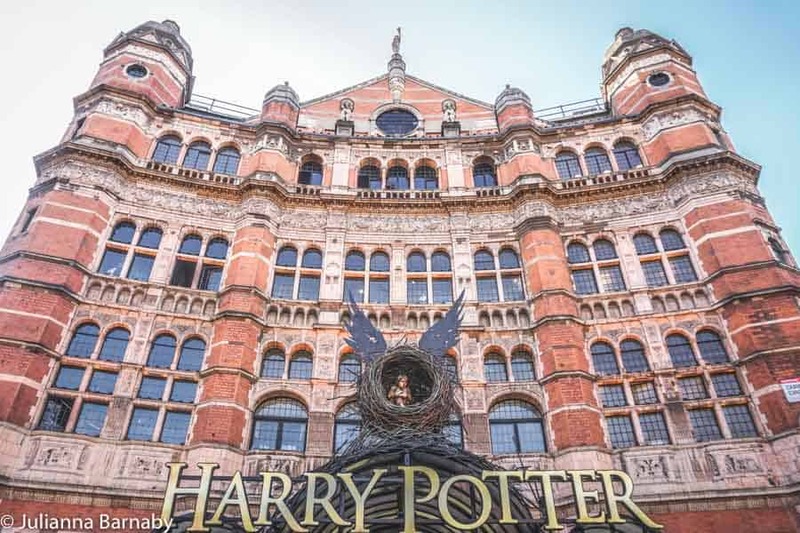 Not to worry, here’s a magical self-guided Harry Potter walking tour of London. 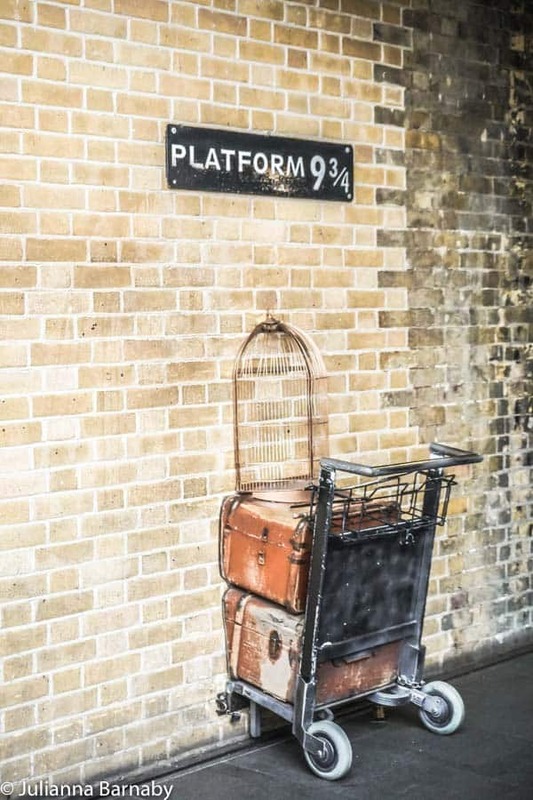 We’ll start our tour at King’s Cross Station – famously home to Platform 9 ¾ (where you can grab your magical photo opp of you pretending to run through the wall and with its own Harry Potter-themed shop. Get there early if you want to skip the queue for the trolley photo. 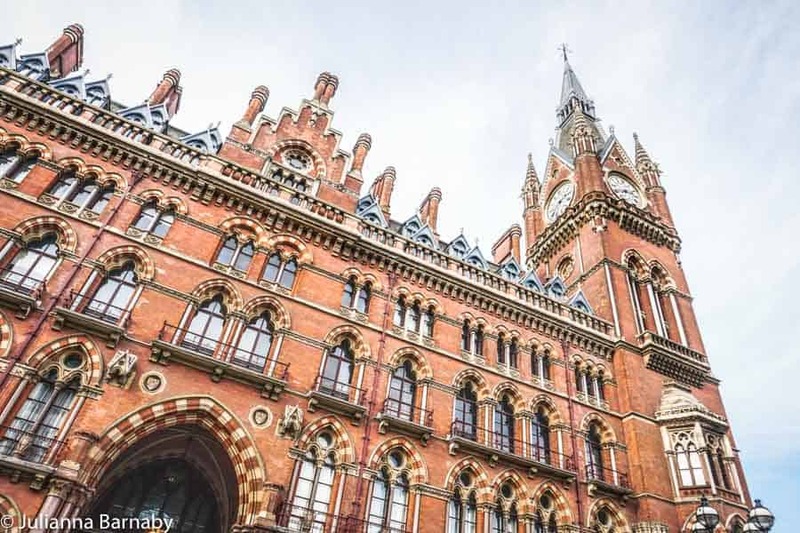 After Kings Cross, it’s a simple matter of strolling across the road to St Pancras International (flying cars unfortunately not included) which doubles up as the exterior of the station from which the Hogwarts Express departs. From there, head to Claremont Square, one of the more tucked away locations on our Harry Potter London walk. It’s about a 15 minute walk from St Pancras – when you arrive, you can peep at the real life spot for 12 Grimmauld Place, the HQ of the Order of the Phoenix. The next stop is pretty far, (around 45 mins) but don’t worry, the walk will take you through some of the prettiest parts of north London. 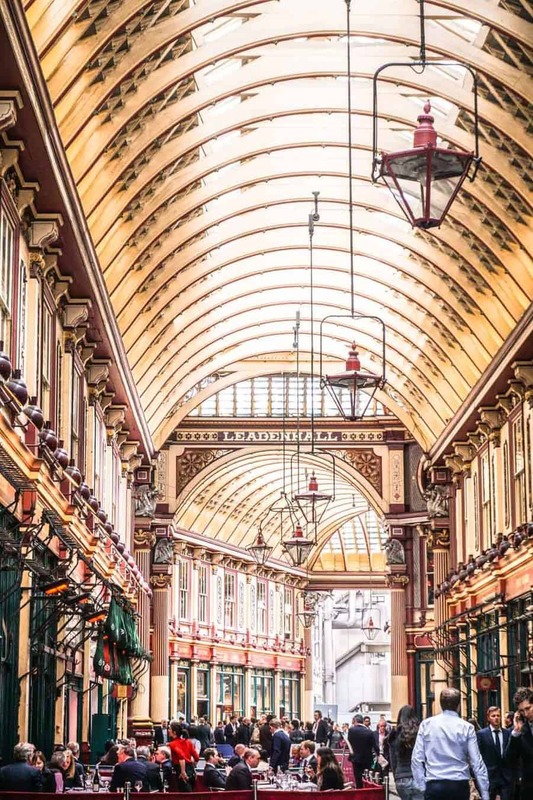 You’re heading to Leadenhall Market – which pops up as Diagon Alley and holds one of the entrances to the Leaky Cauldron pub. From Leadenhall Market, it’s a short zip to Tower Bridge, where Harry does a spot of rather spectacular flying on his broomstick. 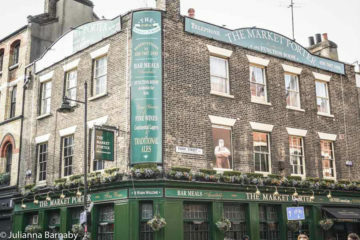 Cross the bridge and head to Borough Market, which is about a 15 minute walk once you get to the other side. Stoney Street, next to Borough Market is the second place that features as the entrance to the Leaky Cauldron (the first was in Leadenhall Market, which we’ve already seen). 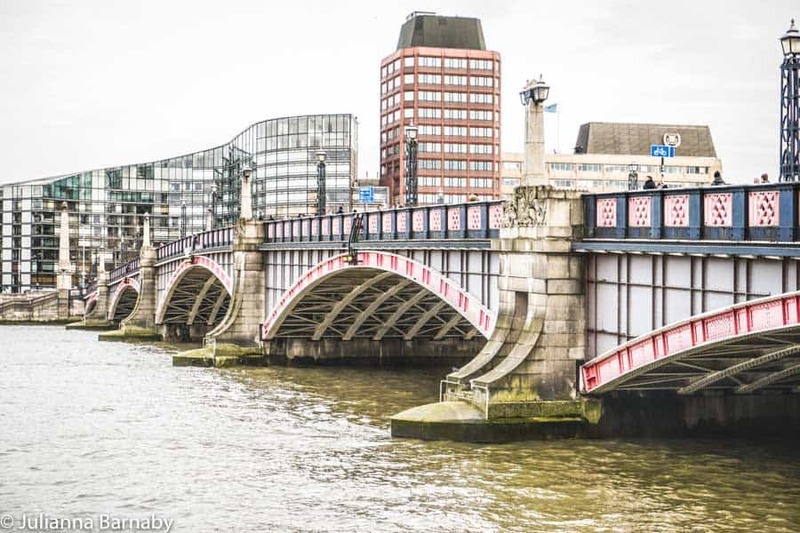 After this, it’s on to the Millennium Bridge – which you should walk over (beware, it wobbles a bit!) to get to your next location. Your destination is Australia House, or Gringotts as it features in the films. Fend off the goblins and claim your riches. 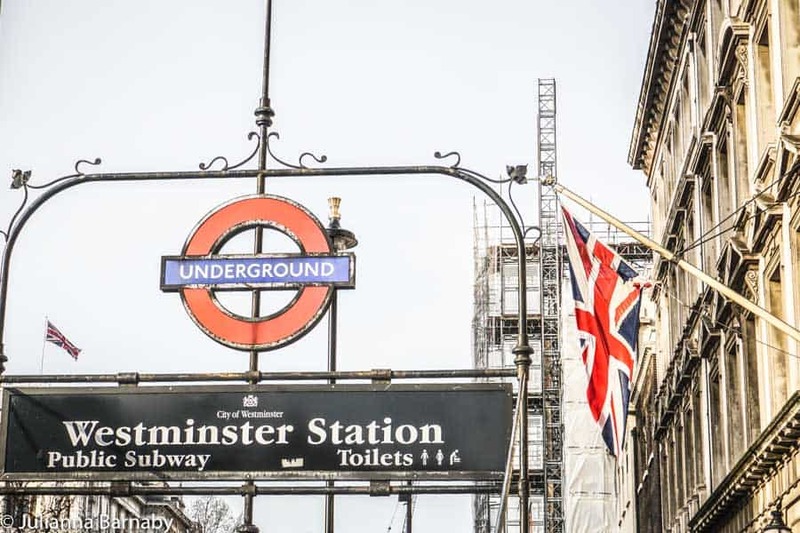 Alternatively, take a few snaps and meander to Great Scotland Yard to hunt for the entrance to the Ministry of Magic, then pop down the road to Westminster Station where Mr Weasley learns about the intricacies of the Underground. It’s only a ten minute walk from there to Lambeth Bridge where you can relive the antics of the Knight Bus, before looping back on yourself to go to Piccadilly Circus. I’m guessing that by this point, you are going to be pretty tired. It’s been a lot of walking (and of magic) for one day. But I’d make the effort for one last stop to pop into the House of Minalima in nearby Soho and see some of the cool graphics that feature in the films (who knows, you can even treat yourself to something to bring home – leaping lizards, you deserve it). And with that, it’s a simple matter of saying Mischief Managed, putting away your Marauder’s Map (OK, the Google Map on your phone if we’re being realistic) and giving yourself a huge pat on the back. Ready yourselves peeps – the Harry Potter Bus Tour takes you on a whirlwind excursion of London’s biggest Harry Potter sights. From the entrance to the Ministry of Magic at Scotland Yard to popping into Diagon Alley and Gringotts Bank – it’s pretty much three hours of non-stop excitement. 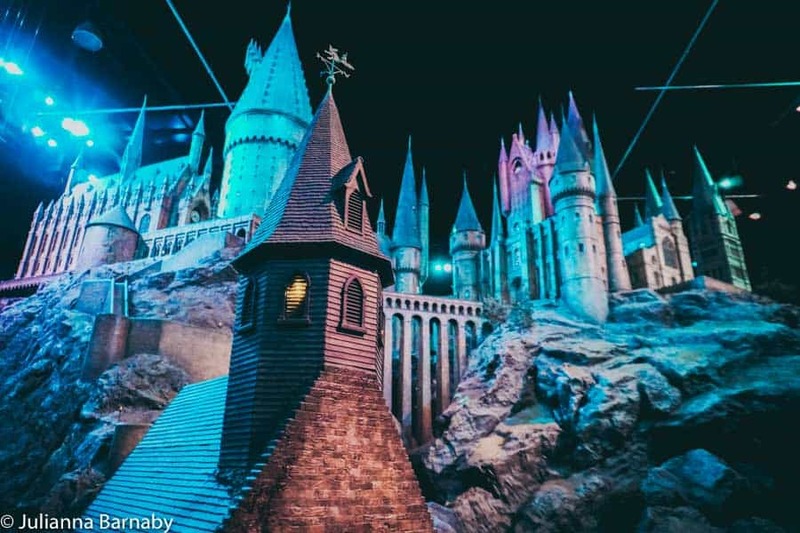 Led by some rather talented guides (there is NOTHING that these people don’t know about Harry Potter), you’re given a glimpse at the wizarding world – complete with insider knowledge about how the films were made. Check tickets and book your spot here. 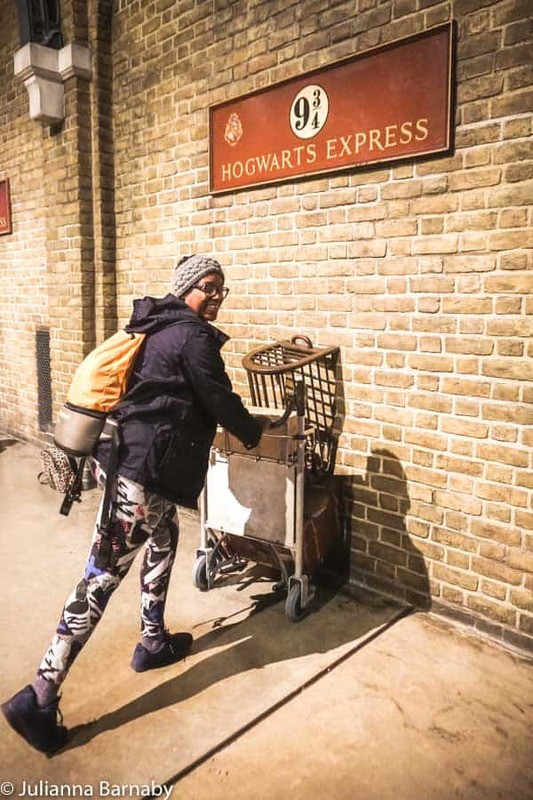 Fun as it is to do your own self-guided Harry Potter London walk – you can also book onto a guided tour for some next-level Potterhead action. Plus there’s no getting lost or having to follow Google Maps either. Simply rock up and follow your guide as they take you around some of the coolest filming locations in the city. Check availability and book your guided Harry Potter walking tour. I hope it’s clear by now that there’s so much magic in London – it’s just a matter of finding it. Here are a couple of practical tips to help you along the way. Wear comfortable shoes to go and do the self-guided walk and allow yourself all day to do it, it’s a biggie! 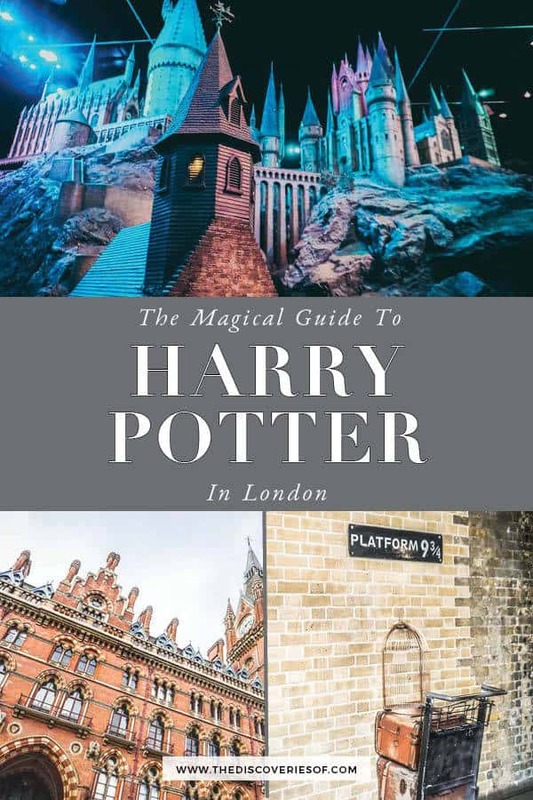 I’ve given you tonnes of information to allow you to explore Harry Potter’s London on your own, but if you want to book a guided tour, check these out. If you don’t live in London, Georgian House has created a series of Harry Potter themed rooms where you can stay. Check prices and availability. 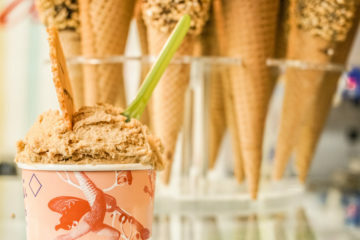 Click here for a Google Map of all the places featured in this article. That’s a wrap guys. I hope you have an absolutely brilliant time discovering all the places featured in this guide. Happy exploring! Looking for more Harry Potter tips and Guides? Check these out. Visiting Borough Market (which just so happens to be one of the filming locations for Harry Potter).